Update: Archived video of the oral arguments can be viewed here. 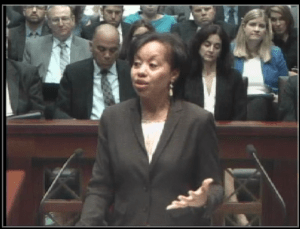 Former Texas Solicitor General James Ho made the case for equitable funding for public charter school students and TCSA General Counsel Denise Pierce drove the point home at the school finance trial before the Supreme Court of Texas on Tuesday. “We want you to send a clear message to the state legislature. Tell them they can’t discriminate against public charter school parents and students. Tell them they can’t require charters to take money away from teacher salaries and computers,” Pierce concluded in her remarks to the Chief Justice and eight Justices of the court. Charter schools are different from traditional public schools, but the Texas Charter Schools Association was there on Tuesday because of the similarities, Pierce said. State law states that charters are a part of the public school system and have to follow the same academic and financial standards, she said. “It’s undisputed that charters receive $1,000 less per WADA, per student. It’s undisputed that charters receive no facilities funding,” said Ho. Several times he reminded the court that public charter schools are forced to “cannibalize their education budgets” to pay for facilities. More than 600 school districts were appellants in the case before the Supreme Court of Texas arguing that the state’s public schools are constitutionally underfunded. Charter schools agreed and added that public charter school students face additional discrimination, because they receive no facilities funding. “We ask the Court to tell the state not to discriminate against charters….They cannot discriminate against charters by giving facilities funding to everyone except us,” Ho said. Pierce pointed out that it is the same as saying that the Supreme Court of Texas has to fulfill its mandated duties and pay for its own courthouses. The state argued that charters signed a contract with the state for a certain amount of funding, and now can’t ask for more than the contractually approved amount. “Charter parents and students didn’t sign a contract for less funding,” he said. The Supreme Court of Texas adjourned just after noon on Tuesday and will likely take several months to publish its decision. Read more about the school finance trial at School Finance Lawsuit: Three Things to Know. Samantha Womack, TCSA Communications Specialist. Email her at swomack@txcharterschools.org with post suggestions, to submit a news item or write a guest column.